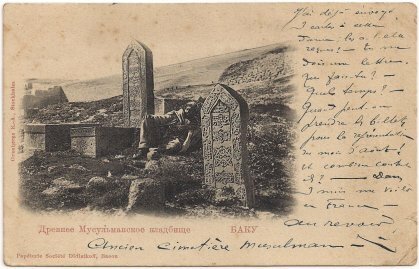 Also travellers in Imperial Russia have sent postcards. Most I like the combination picture and postmark of the same place on a card: we are philatelists. 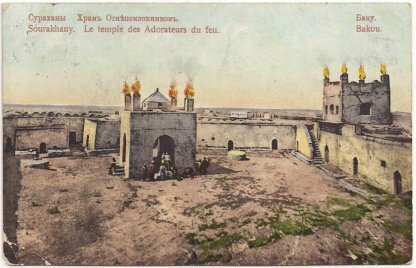 On the pictureside of this card from Baku is placed the picture of 'Le temple des Adorateurs du feu', the Temple of the Worshippers of the Fire. This picture and all pictures below on this page, if not mentioned otherwise: scanned about 300 dpi. Then set right and cut out, resized 25 % of this image and saved as jpg. In the English Baedeker of 1914 this temple is described (p. 458): "About 19 V. to the N.E. of Baku (railway in 1 hr.) lies Surakhani (output in 1912, 36 million puds), containing a Temple of the Fire Worshippers (Храмъ олнепоклонниковъ) built in the 13th cent. in the Indian style and restored in the 17th century. Since 1879 it has been abandoned, but it can be visited on application to the Kokorev works; the lighting of the naphtha gas is no longer allowed. The naphtha gas issuing from the limestone strata outside the temple is used by the adjacent village of Surakhani for lime-burning and other purposes". In Wikipedia more details are given about this temple. The temple is left after 1883: installation of petroleum plants. I suppose it became dangerous to make fire there. From 1975 the complex is a museum. In the past there was a natural gas field on this place and this caused natural fires. in 1969 the gas field gives no longes gas: the museum's fire is now fed by gas pipes from Baku. In the Indo-Iranian branches of hinduism and Zoroastrianism fire is considered sacred: so there is discussion about the origin of the temple, Hindu or Zoroastrian. In Imperial Russia Baku was the capital of the district with the same name. Now it is the capital of present Azererbaijan and is the largest city on the Caspian Sea, the largest lake in the world. The other side of the card: the postmark of Baku, a standard doublecircle postmark. This type postmarks is introduced by the circular no 9 of 3 february 1903. When the old one-ring postmarks wore out, they must be replaced by the double-ring type. About the postmarks of Baku is made an excellent study by P.T. Ashford. In his book he gives an overview of the double circle postmarks of Baku. 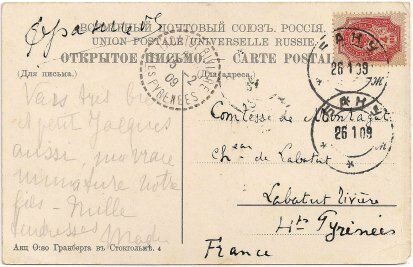 The serial letter of the postmark on this card is ж [zh], the 7th letter of the cyrillic alphabet. Ashford (p. 534) shows four different double circle postmarks with this same serial letter ж: type 37, 38, 39 and 40. In 1907 typw 37 was in use, in the period 1908-1909 type 38, type 39 in 1913 and type 40 in the period 1915-1910. 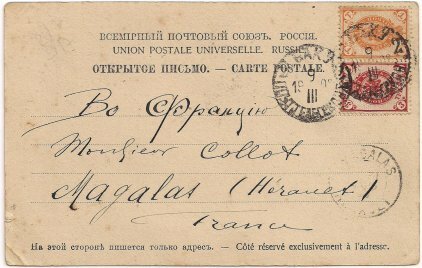 The postmark on this card seems to have been type38: БАКУ [BAKU] with the У not too far down. The date is January 26, 1909, so this is correct I think. 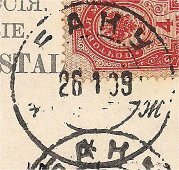 The indication of the city, БАКУ, is not followed by a numeral, so these are postmarks of the main post office. In Imperial Russia Baku was important for the oil. 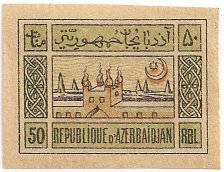 On later postage stamps of Azererbaijan the Temple is depicted with in the background five oil derricks. Azererbaijan became at the first time independent as part of the Transcaucasian Democratic Federative Republic on April 9, 1918. From May 28, 1918, Azererbaijan became an independent republic. This Azerbaijan Democratic Republic was the first democratic and secular republic in the Muslim world. The set (mi. 1x-10x) with these stamps -national symbols- is issued in 1919, October 20, by this democratic republic on white paper. Stamps with the temple: Mi. 9x and Mi. 10x. 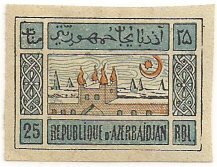 It were the first and also the last stamps of this republic: April 28, 1920, Baku is invaded by 11th Red Army and became capital of the Azerbaijan Soviet Socialist Republic. Mi. 10y, resized 50 %. The Soviet Republic issued these stampa again, now on yellow or grey paper (mi. 9y and Mi. 10y). There are forgeries of Mi. 1x - 10x and Mi. 1y - 10y. Another card with a picture from Baku and sent from Baku. Under the picture is indicated: 'Ancien cimetière Muselman', the old Muslim cemetery. On this card is used an older postmark, the 'crossed-date' postmark of Baku: in circular 13 of 5 April 1890 the instruction arrived to use Roman numerals for new stamps. This happened on suggestion of the U.P.U., the Universal Postal Union. 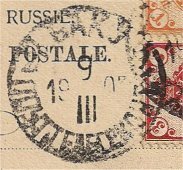 Also the postmarks in Russia changed in the 'crossed date'-type. In the middle the day stays first, under it the month (in Roman numerals), left of the whole the century and right the rest of the year. archive.org/details/ russiawithtehera00baed Russia with Teheran, Port Arthur, and Peking : handbook for travellers (1914). - Translation of 7th German ed. (Leipzig : K. Baedeker, 1912). - With 40 maps and 78 plans. - Maps by: Wagner & Debes' Geogr. Estab., Leipzig. - Railway map of Russia on back endpaper. - Includes index. - Bibliography: p. lxii-lxiv. Imperial Russian stamps used in Transcaucasia: part eight Baku Baku guberniya / P.T. Ashford. - London : British Society of Russian Philately, 1985. The script-letters in the postmarks. On this picture the first 7 'written' letters.